A company of the millionaire founder of the Maximuscle nutrition brand has lost a £9,300 claim over a shed used by its motorsport wing. Maxicorp director Zef Eisenberg accused a worker of breaching a non-disclosure agreement (NDA) by leaking confidential information about the building. He said the former senior engineer at Maxicorp was behind two "vindictive" planning complaints. A judge at Guernsey Magistrate's Court dismissed the claim. 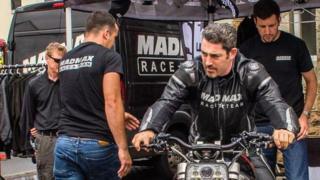 Mr Eisenberg - who sold Maximuscle in 2011 - became the fastest biker to ever ride on sand in 2018, less than two years after a "near-death crash" at 230mph. The court heard the two men had clashed last April when Mr Eisenberg complained about James Larbalestier's work, leading them to stop working together. Tensions between the pair escalated in June 2018, when Mr Eisenberg threatened legal action against his former head of engineering over material posted on social media, the court was told. Mr Larbalestier did so, but four days later the first of two complaints was made to planners about the shed. The complaint was described as "vindictive and vexatious" by Maxicorp, and related to the change of use of the shed, which sits on an agricultural site, the court heard. Mr Eisenberg alleged the planning complaint - which later proved to be unfounded - was made by someone on behalf of Mr Larbalestier. Mr Eisenberg - on behalf of Maxicorp - made unsuccessful attempts to find the identity of the complainant through the courts, and later offered £1,000 for them to come forward. Planners did, however, tell the court neither Mr Larbalestier nor his family members made the complaint directly. In his judgement, Deputy Judge Martin Thorton said the information contained within the two complaints was not confidential under the NDA. "This is information which is already in the public domain or which can, with some effort, be pieced together from what is in the public domain," he said. Mr Eisenberg was also unable to prove the complaint originated from Mr Larbalestier, he added. His £9,300 claim was based on the £7,053 cost of legal advice, and the amount of time he had worked on the dispute. The claim was dismissed, and Maxicorp was ordered to pay court costs. Outside the court Mr Eisenberg said the decision was of "no concern", and he would continue to use the legal system when he felt there was "any form of abuse" of his companies.